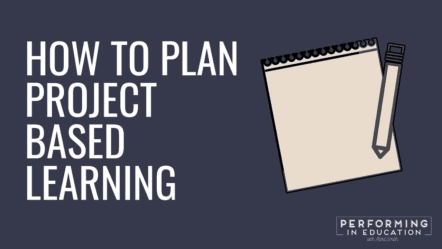 In this post, we’re talking about how to plan project-based learning. This is a general overview of the planning process. I recommend downloading the planning guide to help you get started! Not sure what project-based learning is? Start by reading this post first! The most important part of PBL is choosing a topic that your students will be interested in. You can choose a general category (animals) or zoom in on a specific topic (penguins). It’s up to you! Keep an eye on your class for a few weeks to figure out what they’re interested in. What type of books do they check out? What do they talk about in class and at recess? What games do they play at recess? What items do they decorate their binders with? It’s important to be prepared with some questions on the main elements of PBL. My free planning guide includes these elements organized into tables to help make planning easy! Topic- What topic is your project based around? Driving Question- What overall question do you want students to answer? Inquiry & Choice- How will students learn about their topic? What choices will they make along the way? Inquiry & choice is so important in project-based learning. In regular assignments, you’re looking for all students to get one correct answer. In PBL, there are many ways that students can complete the project correctly. The variety allows for choice and free thinking! How will students critique and revise? What 21st-century tools will they use? Who will be the audience they present their final project to? For teachers that are used to a very rigid classroom, project-based learning can be very scary. Be prepared to give your students more freedom, but take time to practice procedures. You’re going to want procedures for accessing supplies, discussion, and actual work. You’ll also need a procedure for early finishers or students that get stuck. Check out my blog post on classroom management for more information! Explicitly plan out how you will incorporate each element of PBL into your lesson. You can use the Project-Based Learning Planning Pages below [free]. Next, pace out each day’s lesson. The closer you follow the PBL structure in your plan, the better the lesson will go. Enter your name and e-mail address below to get access to my free Project-Based Learning Planning Guide. Make sure to look for an e-mail from me that asks you to confirm to get your planning guide. When you click on the confirmation link, it will take you to your download. I look forward to helping you! You can learn how to explicitly plan out the entire PBL in the Implement Project Based Learning from Start to Finish eCourse. Read the rest of the posts in this series!